Posted by grhomeboy in Music Life Greek. Internationally renowned Agnes Baltsa is scheduled to interpret Greek songs at the Athens Concert Hall on Thursday. “Songs of My Country” will be revived at the Athens Concert Hall this week, under the tutelage of the internationally acclaimed mezzo-soprano Agnes Baltsa along with prominent composer Stavros Xarchakos. The concert, which is scheduled to take place on Thursday, is the outcome of a long-term collaboration between the two artists, essentially a production of songs by Manos Hadjidakis, Mikis Theodorakis, Xarchakos and Vassilis Tsitsanis, featuring Baltsa, accompanied by the State Orchestra of Hellenic Music. The concert also serves as a trailer for a revamped re-edition of a first recording on the project, initially recorded by Deutsche Grammophon back in 1986. During a press conference in Athens last week, Baltsa talked about the difficulties which arise when it comes to interpreting songs which have been described as the “gospel” of a nation. “I sing with great fear and respect, with a sense of responsiblity as much as joy,” noted the mezzo-soprano. Proceeds from Thursday evening’s event at the Megaron will go to the Agapi Charity Organization. Athens Concert Hall, 1 Kokkali Street and Vasilissis Sofias Avenue, Athens, tel 210 7282333. Posted by grhomeboy in Olympic Games. 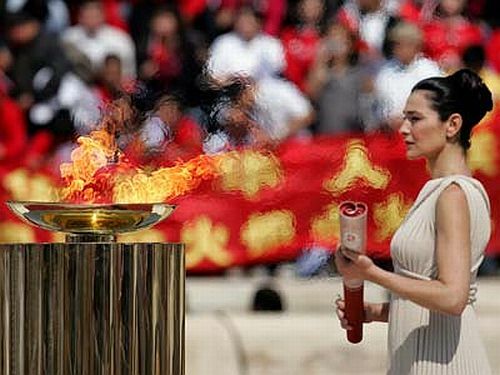 Actress Maria Nafpliotou in the role of a high priestess holds the torch next to the altar with the Olympic Flame during the handover ceremony at a stadium in Athens yesterday. 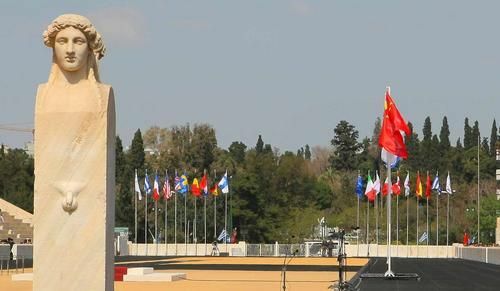 More than 2,000 uniformed and plainclothes police were deployed in the capital at the weekend to ensure the smooth handover of the flame. 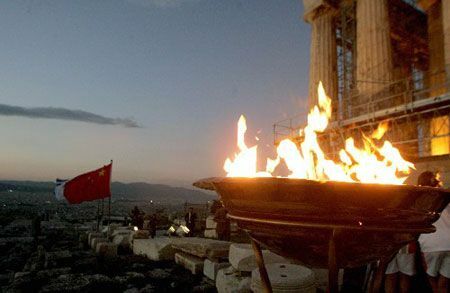 Greek officials handed over the Olympic Flame to organizers of the Beijing Games yesterday amid minor protests by a pro-Tibetan group. 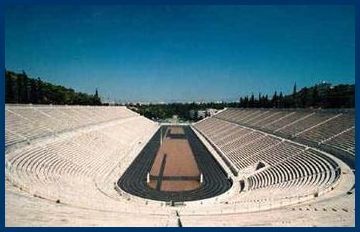 The ceremony was held at the all-marble Panathenaic Stadium, where the first modern Olympics were staged in 1896. Hundreds of police lined the flame’s route, scores of security vehicles followed the torch-bearers and helicopters hovered overhead, the strictest security measures since torch relays were launched at the 1936 Berlin Games. “In 130 days the 2008 Beijing Olympics begin. 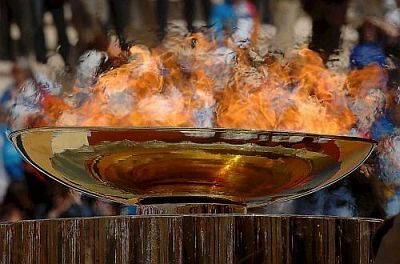 We and the other nations of the world look forward to this moment,” said Beijing Games organizing chief Liu Qi before accepting the flame. The Games run from August 8 to 24. Protesters holding Tibetan flags and shouting “Free Tibet” and “China out of Tibet” failed to break through the police cordon and get to the final torch-bearer entering the stadium. Police detained 21 Greeks and foreigners for staging the protests but said they would be released later. Several others were moved away from police cordons. 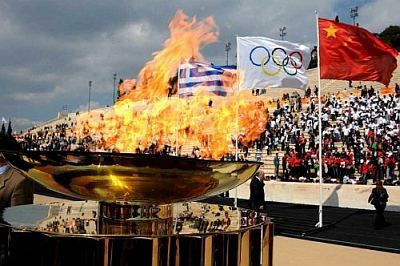 Thousands of Greek and Chinese spectators inside the stadium watched as Greek triple jumper Chrysopigi Devetzi carried the torch into the stadium lined with Greek and Chinese flags. Greek Presidential Guards and actresses dressed as ancient priestesses looked on. On Saturday and Sunday, about 2,000 police were deployed around Athens. The torch will be officially welcomed in China today before beginning a worldwide relay, the longest ever, 130 days and covering 137,000 kilometers. Most of it will be on Chinese soil. Greek actress Maria Nafpliotou in the role of the high priestess lights the altar with the Olympic flame at Athen’s Panathinaic Stadium, 30 March 2008, during the handover ceremony. 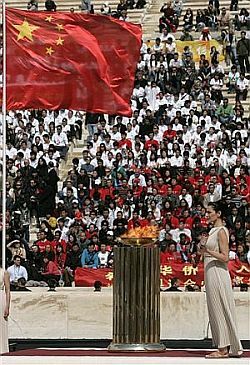 The altar with the Olympic Flame is seen during the handover ceremony of the Olympic Flame to China for the 2008 Olympic Games in Beijing, at the Athens Panathinaic Stadium, 30 March 2008. 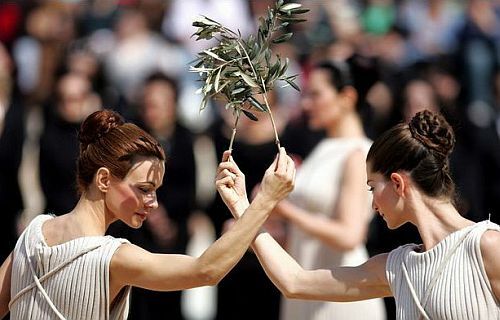 The cauldron with the Olympic flame burns as spectators watch at Athens’ Panathenaic Stadium on Sunday, March 30, 2008. 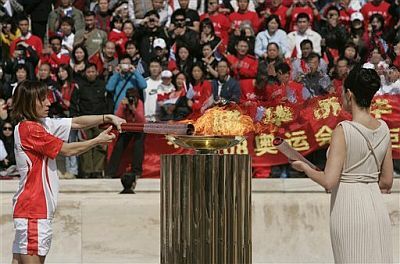 The flame was handed over to the 2008 Beijing Olympics organizers. President of the Hellenic Olympic Committee Minos Kyriakou, handed over the Olympic Flame to Beijings’s Organizing Committee. Mayor of Marathonas Spiros Zagaris (left) kindles a torch from the Olympic flame basin during the sixth day of the torch relay of the Beijing Olympic Games in Marathonas of Greece, March 29, 2008. 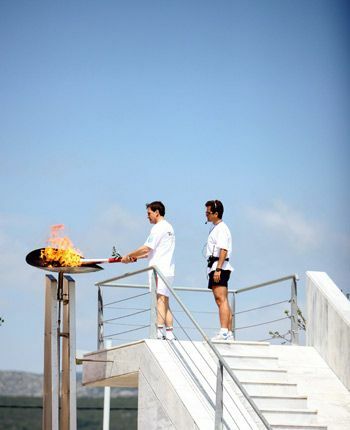 The altar with the Olympic Flame is seen at the Athens Acropolis, 29 March 2008. 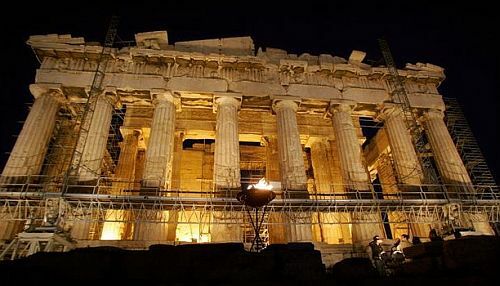 More than 2,000 uniformed and undercover police have been deployed in the Greek capital to secure the official handover of the Olympic flame, which arrived on the ancient Acropolis in Athens yesterday, ending the Greek leg of the torch relay before being flown to China. Entrance to the Athens Panathinaic Stadium, where the first modern Olympic Games were held. 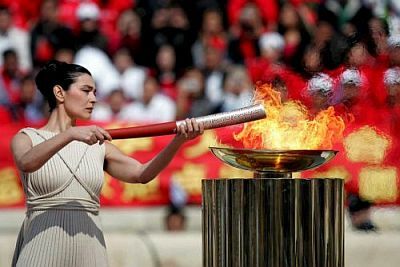 Torchbearer Greek Olympic silver medalist Chrysopygi Devetzi holds the torch with the Olympic Flame at Athens Panathinaic Stadium during the handover ceremony of the Olympic Flame to China for the 2008 Olympic Games in Beijing, 30 March 2008. 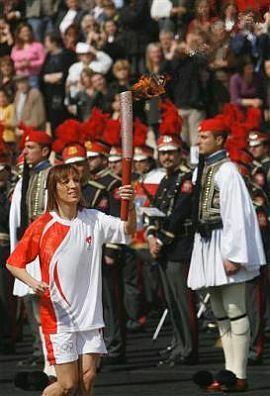 Torchbearer Greek Olympic silver medalist Chrysopygi Devetzi holds the torch with the Olympic Flame at Athens Panathinaic Stadium, 30 March 2008. 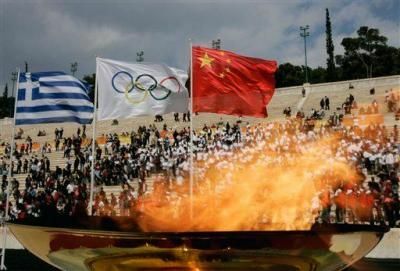 Thousands of spectators gathered in Athens for Sunday’s handover ceremony of the Olympic flame to organizers of the Beijing Games. 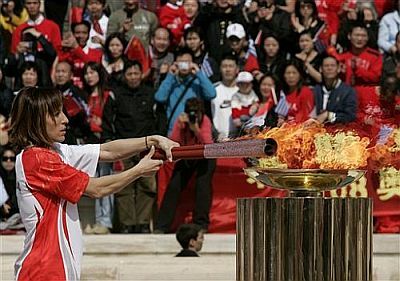 The Olympic Flame has been officially handed over to Chinese officials. 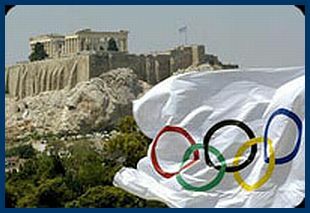 The ceremony took place at the Panathenaic Stadium in Athens, amid tight security. It comes as demonstrations continue in numerous countries over China’s deadly crackdown on protesters in Tibet. On Saturday EU Foreign Ministers agreed on a joint response. The bloc called for an end to violence and urged China to hold talks on Tibetan cultural and religious rights. However, the Ministers avoided any mention of the Beijing Olympics or calls for EU countries to boycott the opening ceremony in Beijing. A small group of pro-Tibet activists tried to stop the flame from reaching the stadium but were held back by police. Demonstrations were also held in other parts of Athens. 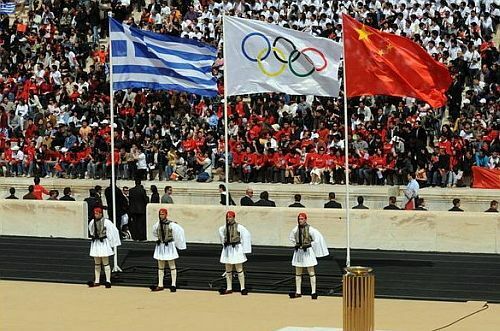 Thousands of Greek and Chinese spectators cheered as Greek triple jumper Hrysopigi Devetzi carried the torch into the stadium, lined with the flags of both countries. Greek Presidential Guards and actresses dressed as ancient priestesses looked on. Witnesses say the protesters, waving Tibetan flags and chanting anti-Chinese slogans, were arrested in Athens Sunday while trying to break through police lines to stop a runner carrying the torch from reaching the handover site. Hundreds of Greek police officers were on alert, after sporadic protests last week along the torch relay route from ancient Olympia. 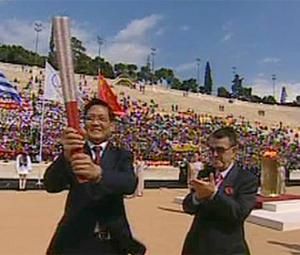 The torch will be flown from Athens to Beijing, where runners will carry it across much of the world in the run-up to the August Summer Games. 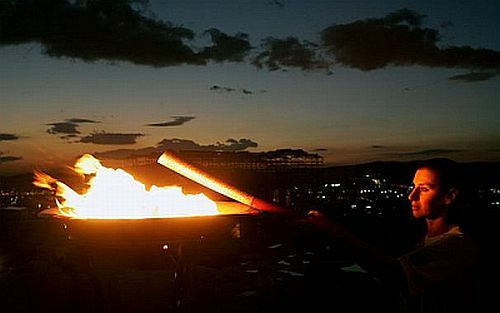 Pro-Tibetan activists have vowed to shadow the torch on its journey. On one leg of the route, the torch is set to pass through Tibet on its way to Mt. Everest. Human rights groups are demanding a ban on that part of the journey, until Beijing agrees to permit an international investigation of the Tibetan unrest. More photos from today’s ceremony follow shortly. Stay tuned!